After seeing design progress documentation, perhaps you are wondering how it would be looks like when the model in complete assembled. I have collected 31 photos from 4 different builders from 4 different country. The first one is Rauf Raphanus, he is my friend and fellow member of PERI, he built War Machine model with "Stardream" colored paper (metallic paper). He used 3 colors, dark gray, silver and gold. The model which he built now stand in front of me on my work desk, I commissioned him to build this War Machine model for me. The second builder is Suraj S. Prakash from India, I used one his built photo for my Facebook timeline cover image. He made the model using color template printed on plain paper. The third builder is Charles from USA, he add one LED inside the chest and distribute the light using optical wire to the eye and both palms. The last builder is Chen Xiangpen from Singapore, he also used metallic colored paper. 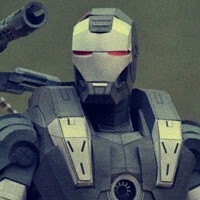 The best part is he also add LEDs inside model's head and chest and make his own wall of armor container for his War Machine model as you can see on one of the photo below. With this post I want to share progress images when I was designing a paper model template for pose-able 1/6 scale Iron Man War Machine. I started this project on 23 January 2012 and finished all 3 parts on 26 April 2012, so I complete this project in about 3 months. I started with collecting photos from the movie and photos from 1/6 figurine on internet. I split this model releases in 3 parts, part one were head and torso. Part two were weapon and both arms and the last were waist, hip and both legs. 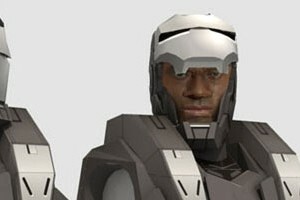 I use 3D Studio Max 7 to make the 3d model and unfold the model with Pepakura Designer. 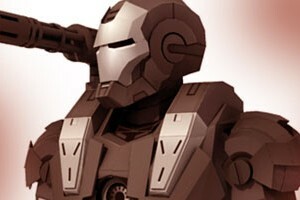 This release is the final part for 1/6 Iron Man War Machine paper model action figure. Part 3 consist of waist, hip, legs and display base parts. Like usual I made the template in two version, the colored one and the blank / white one for colored paper printing. I designed every part in modular segments for easy by build despite of small size parts. I think the instructions are quite clear on how to build this model one step at a time. I already commissioned my friend to build this model since part 1 was released, I will post step by step build photos when he done with all the parts. Finally arm and gatling gun for Iron Man War Machine (WM) is ready after more than a month without any update. It because I was preparing for PERI exhibition on the latest Toys and Comic Fair 2012 in Jakarta, for almost two weeks I didn’t making any template and last week I had a system failure on my PC resulting to re-format my Hard drive, that was also delay this WM progress. As usual I release in two template version, colored with 4 pages and blank one with 5 pages. In 1/6 scale the parts are very small but still can be build. In the last minute before finishing the template I re-examine all pages and found out there were some glue tabs/ flaps that were too small and I have them removed, and some parts have to be simplified because of the size of them, that alone took hours to be repaired. You have top follow all instructions step by step in order, because there are key steps which crucial to be taken in attention. It began when my highschool friend asked me how to buy or make a clone trooper Commander Deviss armor. 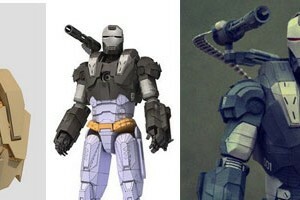 Then I began to search Deviss images on Google and stumbled upon on Iron Man War Machine action figure. I thought both are awesome if I can manage to make them into paper model, but still I can't do it both in the same time. To decide which one is first I made a poll on Paper Replika Facebook page and the responds were majority voted for War Machine. Inspired by Korean Gundam paper model designers that mostly are using colored paper for their build, I also made this War Machine paper model with blank templates, so that they can be printed in dark grey and silver metallic colored paper. The modeling process is a bit longer from usual because I decided to make this 1/6 scale (12 inch - 31 cm) action figure to be pose-able. It's too long so I thought it better be quite detailed and I add a face inside the mask. I plan to release it in 4 parts, first in this release : torso and head, second : gun and arms, third : waist and hip and the last are leg parts. The face can be customized with your own face, this is how to do it.